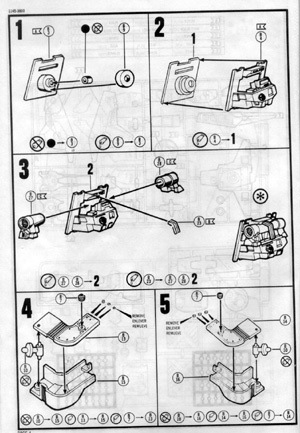 Instructions: Assembly diagrams in 38 steps, plus decal placement and paint guide. Back in the early 1980's, Revell was looking for a way to cash in on the transforming giant robot "craze". 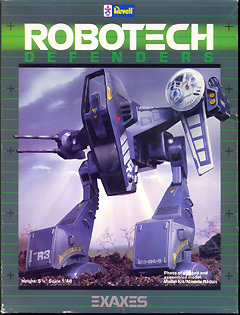 Robotech Defenders were one result; a line of scale model kits that was supposed to complement Robotech Defenders comic books. DC Comics' three-part miniseries was so bad it folded after just two issues. The model kit line, however, was more successfull. Revell imported and re-boxed a number of models from Japanese Macross, Dougram and Orguss lines, giving them new names. Many of these designs later migrated to the Battletech tabletop wargames. Revell's Exaxes was one of these kits. Originally the Ishforn from Studio Nue's Super Dimension Century Orguss anime (one of three Super Dimension Century series, the others being Super Dimensional Fortress Macross and Super Dimension Cavalry Southern Cross, both of which would be blended into the English-language Robotech cartoon), it was a 2-man, lightly armed, reconnaissance mech specially configured for rough terrain. 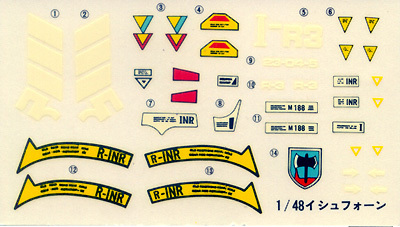 The kit was first released by Arii, and the sprues are still stamped with the Orguss series name and Arii's logo. The copyright on Revell's instructions is 1985. The box was open, but all parts and accessories accounted for, so I figure I got it for a decent price. 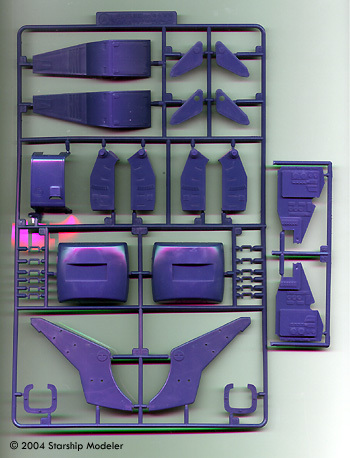 Inside were four sprues of purple plastic, one of clear, another of polycaps, plus instructions, decals and an advertisement for all the rest of the kits in the Revell series. 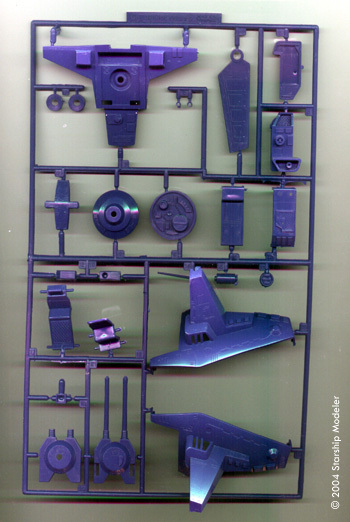 The plastic parts are typical of 1980's kits. There's very little flash and no sink marks on any of the parts in my kit. Detail, whether engraved or raise, is neither as sharp or as deep as we would expect from a new kit, but it's certainly not bad. The main pieces (body, legs, sensor pack) look nicely done, with engraved panel lines and access hatches, and plenty of raised shapes. Details, like intake screens and hydraulic hoses, are more clumsy; you'll probably want to see what you have lying around that will look more the part. Clear parts are still quite ... well, clear ... and free of distortion, and a plastic bag has kept them scratch free these past 20 years. A dip in Future and they'll look like glass. Revell's instructions haven't changed in at least that long. Exploded assembly diagrams, annotated with paint call-outs and arranged in a logical sequence of construction steps, fill a 14 page booklet. The back cover shows where to put the decals. I've not built an older Revell kit yet that didn't have something confusing or ambiguous in the instructions at some point, and I'm sure these are no different. However, anyone who has built a mech or two should be able to puzzle through the less clear areas. The decals appear to have held up well over the years. For what that's worth: they're thick, with lots of carrier film. As befits the origins of the model, they're also "cartoony", with very bright colors and simple designs. Mine look useable, but I won't even try. Unless you really, really want to replicate a vehicle from the show, I would suggest ditching the decals and finding more believable markings (especially stencils). Not having built the kit yet, I can't really comment on parts fit. I would only note that kits of this era tend not to have the tight tolerances and precise fit of the latest and greatest from Tamiya or Bandai. You'll need putty. And sanding sticks. And gap-filling superglue, and maybe some scrap styrene for shims if you're really unlucky. I don't think this is a bad little kit, overall. Detail and quite probably fit are not up to today's standards, but are certainly no worse than contemporary kits. Anyone who has built a styrene kit before will have little difficulty assembling this one. The subject is unique - no shining anthromoporphic metal monster here; it looks like it might actually do what it's supposed to. Those who find joy in the less-trodden paths - as well as fans of the Orguss anime - will need no further recommendation. As for myself ... swap out the weapons and sensor assemblies for machine guns, and reconfigure the cockpit to hold a 1/35 scale driver .... and it looks an awfull lot like something a WW2 Aussie mechanized unit would use to patrol the perimeter of an airfield hacked from a South Pacific jungle, don't you think? Many thanks to my wallet for providing the review sample. Manufacturers and retailers, interested in getting your wares reviewed and publicized on a site averaging 3500+ readers a day? Contact us!